78 Heathwood Gardens is a Victorian terraced house. The proposal is for a side extension situated at the rear of the house. The houses either side of no. 78 have been extended and have loft conversions. 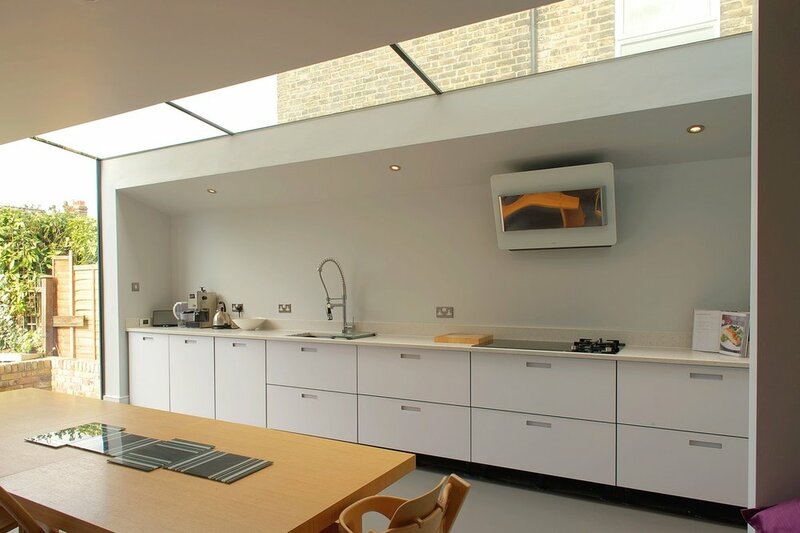 The proposed extension will fill the gap between the party wall and the existing kitchen to create a larger kitchen/dining area. This proposed kitchen will be accessed from the existing corridor and a newly formed opening from the existing living room. 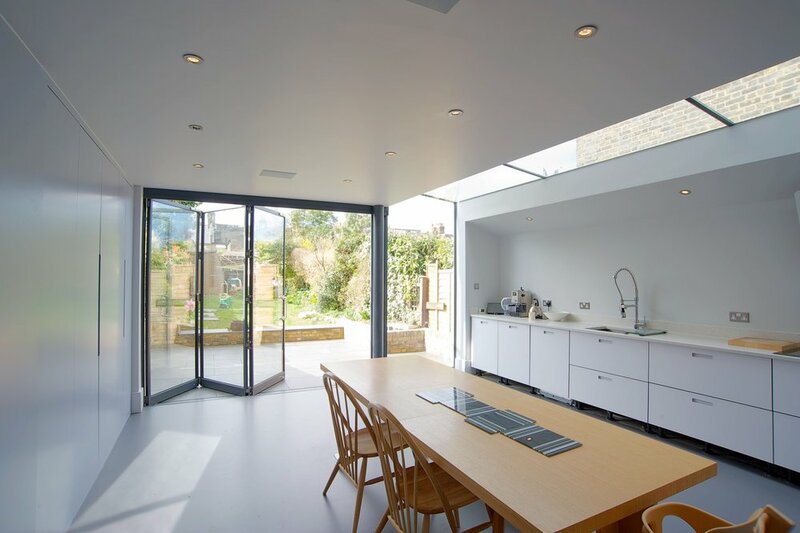 The extension’s roof incorporates a mono-pitch to reduce the massing on the party wall side. 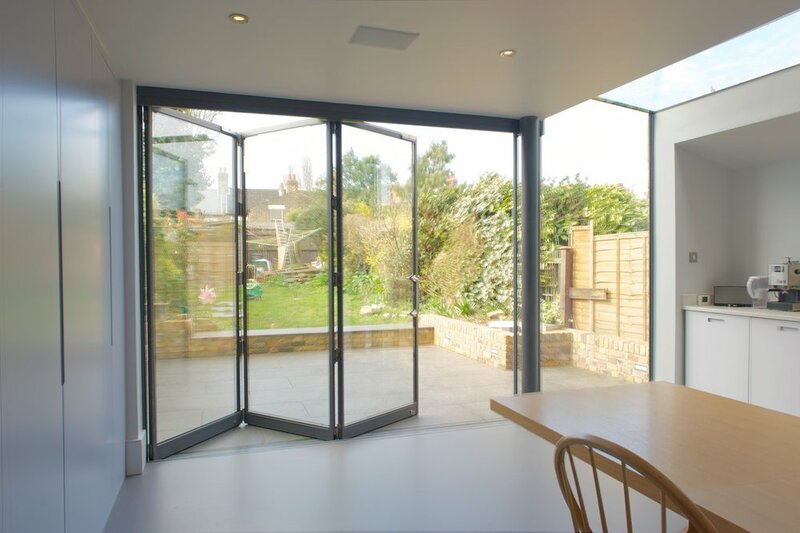 This therefore allows a maximum amount of sunlight into the neighbours’ garden, preventing over-shading. A 45 degree line projected from the neighbours’ window cill is left unblocked. At present the existing 1.8m high timber fence along the boundary line is fixed on a brick base and also has ivy and laurel growing above it. Therefore, the proposed party wall will not be higher than the existing boundary fence due to the sloped roof section, which will be clad in lead to form a valley gutter. The façade is modern, yet also incorporates re-used London stock brickwork to match the existing. 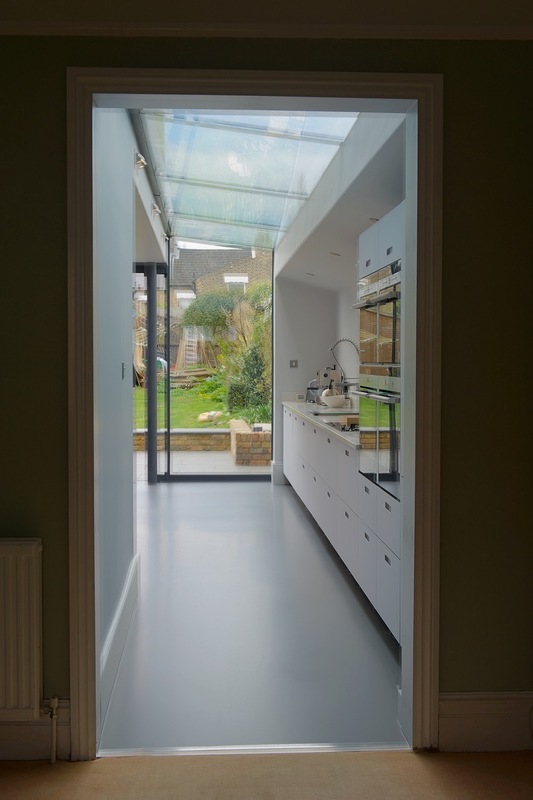 The use of traditional materials to match the house is contrasted with a modern glazed façade that allows maximum sunlight into the kitchen and enhances the linkage to the garden. 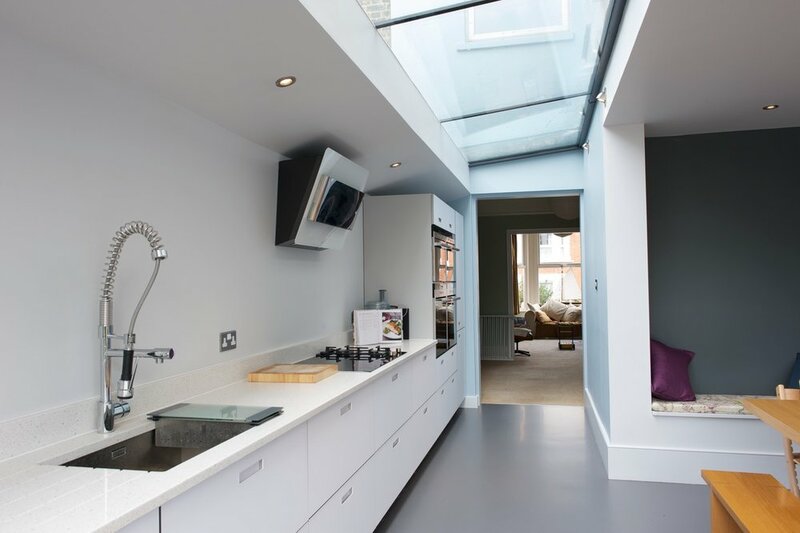 A skylight also runs the full length of the extension to maximise sunlight in the kitchen. Half of this glass façade will be a single glass (frameless) panel, which will be fixed with stainless steel hinges to the brick wall. A galvanised steel hopper will be used to take water from the proposed valley gutter. A new patio will be constructed to be level with the kitchen floor and the garden redesigned to integrate the extension with the garden. 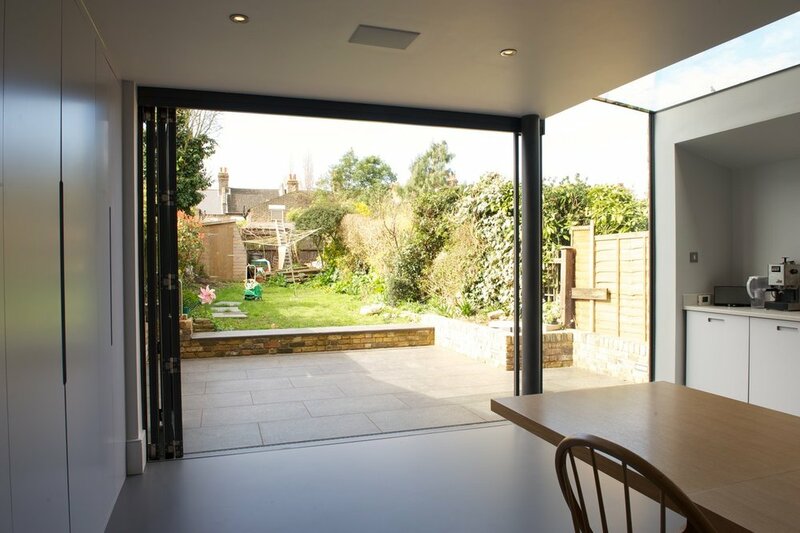 This small extension of only 15m2 would enhance both the internal layout of the house and external elevation and the garden. At present, the existing conservatory (of 13m2) is adhoc in character and made of timber and UPVC. Also the layout of the kitchen is similarly adhoc and confused in layout. The proposal is to remove the conservatory to make space for a new patio and garden design. The existing high fence and planting along the boundary will be lowered in height and the gardens will be replanted and designed to refresh the space, which is presently underused and neglected due to the existing layout of the house. This simple and modest proposal would enhance the house and garden generally, whilst only adding an extra 2m2 to the total floor area.